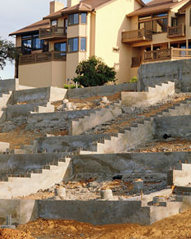 Are you having trouble finishing a concrete project for your client because of hard-to-fill areas? ABC Concrete Pumping Inc. is your solution. Since 1992, our diverse crew has been providing all manners of concrete pumping services for underground and aboveground projects. We use boom, line, and truck-mounted pumps to ensure same-day concrete pumping services for contractors. For your convenience, we offer night work and can provide subcontractors from the New York area for other concrete jobs you need done right the first time. Contact us today to have any of our concrete pump trucks arrive at your jobsite. Armed with more than 28 years of combined experience among our professionals, our family-owned-and-operated company is more than able to help you pump concrete for a project that's finished on time and under budget. Hire our New Hyde Park, New York, company to use trucks that pump concrete into areas you can't reach. When there's no way you can reach a certain area to fill it with concrete, call on our experts to finish the job efficiently and quickly. Finishing your job on time means happier clients for you, which will then lead to more business for your company down the road. Call us today at (516) 561-1066 for more information about pricing on pumping services from our concrete pump trucks.